“There’s no air up here!” is an expression I’m all too familiar with. In fact, it’s an expression I’m sure I yelled in between gasps at my friend Kelly last week while cresting 8,000 feet in elevation during a run-hike in Bozeman, Montana. I live at 187 feet above sea level and some of that is bonus vertical since I call a fourth-floor walk-up apartment my home. My story is not that dissimilar to many of you, living at relatively low elevations but with a distinct hankering for running and racing in the alpine. 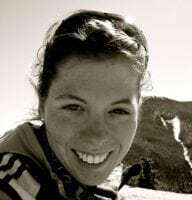 Independent of if you are preparing for a running vacation in the mountains or a Hardrock 100 qualifier, the effects of altitude acclimation do not go unnoticed. I hope in this article to not only explain what happens physiologically when we trek into higher elevations, but also what you can do to prepare for running and racing before you get there. The verdict on altitude acclimation is that, if you are healthy, nothing beats the real stuff and finding some quality mountain time might be in your future. Additionally, if you are traveling to moderate or high elevations, you should know that although the initial, or acute, adaptations take place in the first three to four days, the bulk of the performance-enhancing adaptations take 21 to 28 days to fully manifest. Read on to learn more. The distinctions and effects of different altitudes (18). 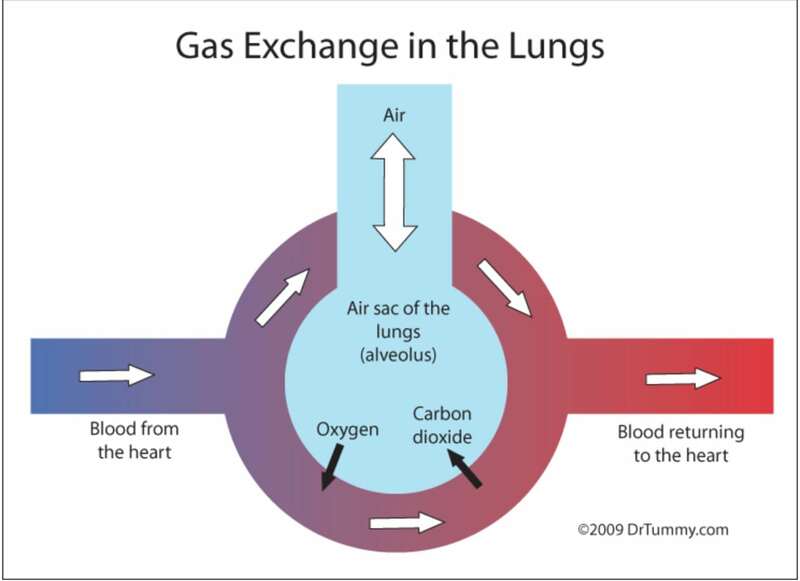 Gas Exchange: Where’s the Oxygen? Despite popular phrases about there being ‘less air’ the higher up in elevation we venture, that’s not exactly true. Despite the change in altitude, the gases that make up the air around us remain the same: 20.93% oxygen (O2), 0.03% carbon dioxide (CO2), and 79.04% nitrogen. What does change, however, is that there is a decrease in the partial pressure of oxygen as altitude increases (1). The partial pressure of oxygen is the portion of the total gas pressure exerted by oxygen on the atmosphere’s volume of gasses. This is largely due to gravitational attraction, as the molecules that make up the air at higher elevations have less ‘weight’ because they are both ‘standing’ on the molecules below them (putting pressure on lower air molecules) and also have less atmosphere pressing down on them from above. That’s where the term ‘thin air’ comes from. This is important because our lungs rely on a pressure gradient, or the difference in pressures of gases like O2 and CO2, to move oxygen between our alveoli, or the air sacks of our lungs, and our blood (2). As we ascend to higher elevations and the partial pressure of O2 decreases, the pressure of O2 in the air we inhale and the O2 in the blood surrounding our lungs gets closer to equal. When this happens, it is harder for gas exchange to take place and the O2 that we inhale is not being as readily driven from our lungs into our blood. This, in turn, makes it much harder for us to get the O2 we need to our brain and muscles while we run. The oxygen we inhale is transferred to our blood using gas exchange at our capillary beds. Capillaries are the smallest blood vessels in the body, at only one cell thick, and when they form a network, or capillary beds, between our arterioles an venules, both slightly larger blood vessels, they are the site where O2, CO2, and other nutrients are exchanged between the lungs and the blood. Oxygen-poor blood is pumped from the heart toward our lungs. Once at our capillary beds, O2 moves from our alveoli, or the sacs in our lungs, to the blood and CO2 is offloaded. The O2-rich blood is then pumped back to our heart and then to the rest of our body. Image from http://mysciencevirtualclass.blogspot.com.br/2011_01_01_archive.html. You can see there is a steady decrease in inspired, or inhaled, oxygen as you gain elevation. Remember that room air at sea level is 21% oxygen, hence the highest percent of fractional inspired oxygen you can have is 21% (1). Our bodies are well-equipped to adapt to harsh environments and climates at the systemic and cellular levels in order to keep us alive. It’s because of these system-wide adaptations that we not only can survive at high altitudes, but we can also live, perform well, and thrive overall in them. 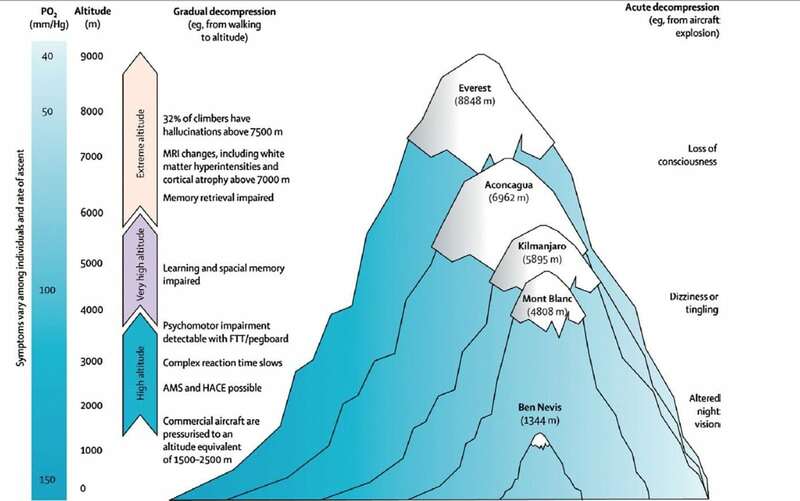 The scientific literature is rich in human trials of altitude acclimation. From military activity to mountaineering, physiological feats up high have inspired generations of scientists. However, I think the biggest driver in performance-related high-altitude research was the 1968 Summer Olympics in Mexico City. The Mexico City Olympics were held at 7,350 feet (2,240 meters) above sea level, higher than any other Olympic games in history. The Mexico City Olympics were interesting because, despite the high elevation being a negative influencer and a performance reducer in endurance-running events, the ‘thin air’ created optimal conditions for record-setting performances in jumping, vaulting, and throwing events along with all men’s track events shorter than 400 meters due to decreased air resistance. This was an environmental phenomenon that had not been considered before as both a performance reducer and enhancer, depending on the event. When we travel to altitude to race or run, our body goes through a series of adaptations to counter our decreased ability to adequately transport oxygen. Some of these adaptations begin rapidly, even within the first few hours of exposure, but many take several weeks to fully develop, and it’s this chronic exposure that ultimately yields performance benefits. These adaptations not only affect our respiratory system, but we also see changes in our cardiovascular and metabolic systems over time. These adaptations include, but are not limited to increased ventilation, increased red-blood-cell mass, decreased sensation of effort, improved metabolic efficiency, and possible improved running economy, the last of which may occur for reasons which remain unclear (3). The most immediate response your body has to altitude exposure is a decrease in your blood volume. During the first few hours, your blood plasma volume can decrease by 10 to 25%. What’s really neat about this acute response to altitude is that your body does this to intentionally and artificially boost the density of your red blood cells. This is known as haemoconcentration. This, in turn, increases your hematocrit, or the percentage of hemoglobin per unit of blood, which temporarily increases your body’s ability to transport oxygen before it has the chance to produce more red blood cells (3,4). This phenomenon may be why you often feel really good during your initial run at altitude before you start to feel the effects of your body trying to make more substantial adaptions 24 hours later. During this time, you will also experience a brief increase in your resting and submaximal cardiac output. Remember, cardiac output = stroke volume x heart rate. Think of this equation as the work load your cardiovascular system manages. During the first few days at altitude, your stroke volume decreases as a result of the initial drop in blood-plasma volume. Also during that time, your heart rate increases, which is your body’s effort to make up for the decrease in stroke volume, to the extent that it increases your cardiac output at rest and submaximal levels. However, after a few days and as your body becomes more efficient at extracting and delivering oxygen, your cardiac output and heart rate begin to normalize at rest and during aerobic activity (3). However, at high altitudes and for a longer period of time, maximal heart rate and stroke volume at highest intensities are often blunted. This combined with poor oxygen exchange and we overwhelmingly see a decrease endurance performance and a decrease in VO2max of 8 to 11% for every 1,000 meters (3,280 feet) you ascend above 914 meters (3,000 feet) (5,3). It is because of these changes that are rapidly taking place that we generally feel terrible 24 hours to 72 hours after arriving at altitude. It is also why exercise physiologists suggest that you limit your activity intensities to 60 to 70% of VO2max when you first arrive at altitude to prevent maladaptation, injury, and unnecessary fatigue (1). Another of the first changes that occurs when you arrive at higher elevations is in your ventilation rate, which might leave you feeling short of breath while running. These changes to your ventilation rate and depth, where you ventilate more and more shallowly, are known as hypoxic ventilatory response (HVR) (2). When HVR occurs, our lungs can increase the rate of diffusion in our alveolar space by 25 to 30%, increasing the partial pressure of oxygen in our lungs and driving much-needed O2 into our blood. However, this increase in ventilation causes a cascade effect with more CO2 than normal expired, which can lead to hypocapnia, or lower-than-normal CO2 in the blood, and eventually respiratory alkalosis, a pH imbalance in the body (1). Our bodies have a finite window of pH tolerance, and when we begin to experience a pH increase during hypoxia, our kidneys respond and correct the pH shift via renal-compensation mechanisms. The primary mechanism for countering this is diuresis, or more urination. Additionally, during this same time, there is an increased release of erythropoietin (EPO) (2). EPO may sound familiar to many of you as an illegal performance-enhancing drug of choice, particularly in road cycling, to boost red blood cells. However, EPO is also produced naturally by our kidneys when stimulated by hypoxia-inducible factor-1 (HIF-1), a protein that helps regulate the body’s O2 consumption that we’ll talk more about shortly. A shift in blood-oxygen levels creates a cascade of reactions leading to the kidneys producing and releasing erythropoietin (EPO), which, in turn, stimulates red bone marrow to produce more red blood cells (6). The increased diuresis at altitude is called hypoxia diuresis response (HDR). HDR occurs in response to HVR because during that increased time of ventilation and increased body pH, the body starts to also increase its excretion of sodium and bicarbonate ions in your urine and retain more hydrogen ions in your body to try to shift you back toward equilibrium (2). This is also one of the ways the body creates the haemoconcentration I mentioned earlier, decreasing your blood volume by offloading fluid through increasing urine output. The downside of this is that, as an athlete, you are at an increased risk of dehydration through excessive fluid loss via urination and decreased fluid intake due to decreased thirst while at higher elevations, a phenomenon that is not fully understood (1). Another trick our kidneys perform while exposed to high altitude is to produce and secrete more EPO into the blood stream. EPO triggers erythropoiesis, the process of creating new red blood cells in your bone marrow. Although EPO is released into the bloodstream in the first few hours of altitude exposure, erythropoiesis takes at least one week but as much as two to three weeks to allow the red blood cells to mature and become fully functional (9). This is what is ultimately responsible for your blood-plasma volume returning to normal and then ultimately increasing to above baseline. Along with the increase in red blood cells, there is an increase in hemoglobin, the red, iron-containing, oxygen-transport protein found in red blood cells. This increases both the oxygen-binding and oxygen-carrying capacity of our blood. In order to help offload this increased transported oxygen into our body’s tissues from our blood, our body pulls one last trick, increasing the concentration of 2,3-diphosphoglycerate (2,3-DPG) in our red blood cells (2). Basically, 2,3-DPG is a compound that encourages the release of oxygen from hemoglobin to tissues that need it the most. It does this by binding to hemoglobin in a special way that encourages it to release its already bound oxygen instead of picking up more, delivering oxygen to tissues more quickly. Normally, hemoglobin only releases 8% of the oxygen molecules it is carrying, but 2,3-DPG forces it to release up to 66%! Historically, research has suggested that the minimal elevation required to stimulate EPO release is 6,890 to 8,200 feet (2,100 to 2,500 meters) above sea level but more recently there is evidence that chronic exposure (21 days) to 5,905 feet (1,800 meters) was enough to stimulate hematological changes while chronic exposure to 5,250 feet (1,600 meters) was not enough (15,13,16). 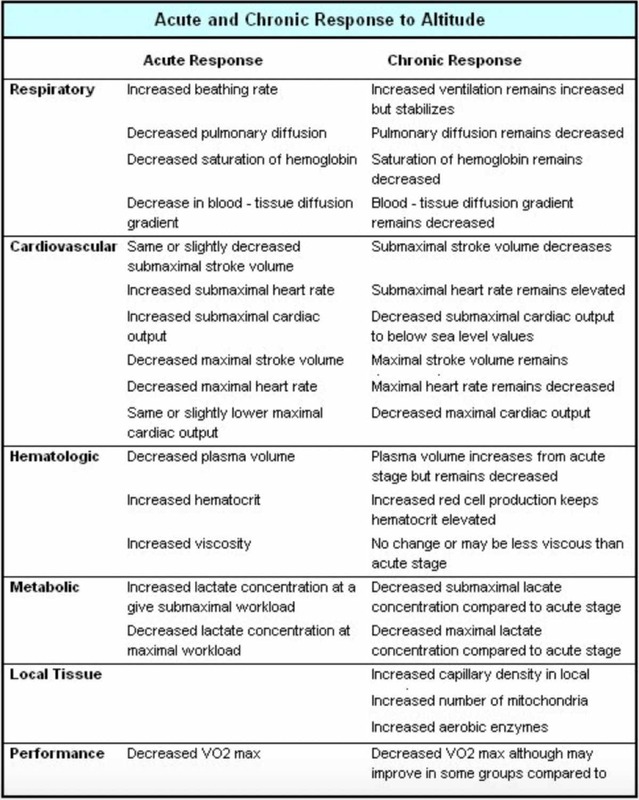 A summary of system-wide acute and chronic, or short-term and long-term, adaptations to altitude exposure (2). There are two major cellular-level changes that take place when we are exposed to altitude. Hypoxia-inducible factor-1 (HIF-1) and heat shock protein 90 (HSP90) help our bodies achieve cellular tolerance to ascending to high elevations (4). I know, that’s a lot of words, so let’s start with HIF-1, which I mentioned before. HIF-1 is thought to be the key genetic influencer in many of the adaptations that are part of altitude acclimation. In fact, not only does HIF-1 play a role in stimulating cells that are responsible for EPO production, as mentioned previously, it also activates genes responsible for angiogenesis (creating new blood vessels), the upregulation of glycolysis (the breakdown of glucose), and it also coordinates iron uptake and delivery to the bone marrow for increased hemoglobin production (1,4). HIF-1 is essential to how oxygen is transported through our body’s entire circulatory system. I mentioned heat shock proteins briefly in my article on heat acclimation, but essentially HSPs are molecular chaperones that provide the maintenance and clean-up of damaged cells and proteins from a multitude of different sources, including heat exposure (7). Heat shock proteins, in particular HSP90, capture and refold denatured proteins, which protect cells from future thermal damage. Curiously, HSP90 has also been found to interact with HIF-1. It turns out that HIF-1 continuously degrades, or becomes defunct, in oxygen-normal environments. Generally speaking, HIF-1 stabilizes with altitude exposure and works properly. In cancer research, looking at uncontrolled cell growth caused by HIF-1, we have seen that an increase in HSP90 can interact with HIF-1 and cause it to stabilize (17). What is really interesting here is the potential exercise physiologists see in stimulating and controlling HIF-1 via a different modality aside from altitude. 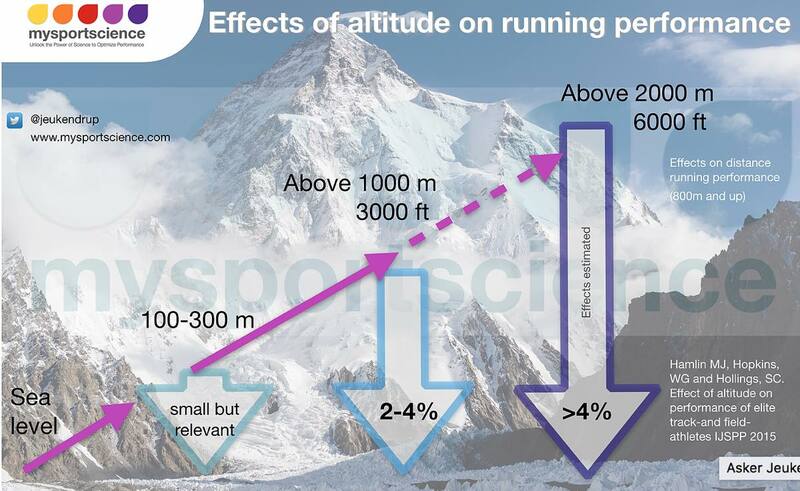 What if we used heat exposure to increase the release of HSP90, and thus increase the upregulation of HIF-1 and all the benefits that come from it without traveling to altitude (7)? This is known as cross-acclimation because we are using one stimulus and acclimation to get benefits for an entirely different environmental factor. Cross-acclimation is incredibly exciting but much newer in the scientific literature and few studies have yet been done. As you can imagine, there is a lot of interest in this new modality as a way to prepare people who need to travel to altitude quickly or who do not have the means for altitude exposure where they live (7,8). Most of the debate about methods of altitude acclimation or using altitude training to get a performance boost at higher elevations and at sea level is centered around the debate between the ‘live high, train high’ method and the ‘live high, train low’ method. If you have the ability, time, and money to orchestrate your own high-altitude training camp or if you live at moderate to high elevation, you might be curious to know the ideal set-up. Given all the research out there, there is pretty much a general consensus that the ‘live high, train low’ method leads to the greatest performance benefits (10). This is because you get both the chronic altitude exposure necessary to stimulate hematologic changes, while maintaining quality workouts, achieving a higher workload while getting enough recovery. Even better is a newer method known as ‘high, high, low,’ which is ‘live high, do low-intensity workouts high, and high-intensity workouts low.’ The best of all worlds (10)! However, there are few training sites that allow this convenience, and since this is not the norm for many of us, we’ll focus on the basic methods of altitude acclimation. Here are some potential training sites where the ‘live high, train low’ training methodology is possible and convenient. As you can see, it’s a short list (10). The two primary classifications of altitude acclimation are hypobaric hypoxia exposure and normobaric hypoxia exposure. Hypobaric hypoxia is more or less normal altitude exposure with low partial pressure and low oxygen and can be from the natural environment or can be simulated by use of a hypobaric chamber. In these cases, you are mostly living and/or training at elevation that is naturally occurring. For example, last year, because I live at sea level, I timed my build-up to the Leadville Trail 100 Mile with a road trip to visit friends in Bozeman, Montana, as well as Steamboat Springs and Breckenridge in Colorado. On the other hand, normobaric hypoxia is always simulated with the air pressure being whatever the elevation you are at and the oxygen content being altered by means of an altitude room, altitude tent, or breathing in a mixture containing a smaller percent of oxygen than what is in the room air. In either case, it’s a question of dosage. How high and for how long? This is less critical if using the environment for hypobaric hypoxia exposure. The basics being that it’s important for chronic exposure to take place above 5,905 feet (1,800 meters) and below 9,842 feet (3,000 meters). There isn’t necessarily a decrease in benefits above 9,842 feet, however there appears to be no added benefit from a hematological and ventilatory adaptation standpoint. Think of it as the minimum effective dose for maximizing your gains. As far as duration, it appears that these adaptations require a minimum of two weeks of exposure, but ideally up to four weeks as there appears to be exponential benefits that occur daily for every day between day 21 and 28 of exposure (10). 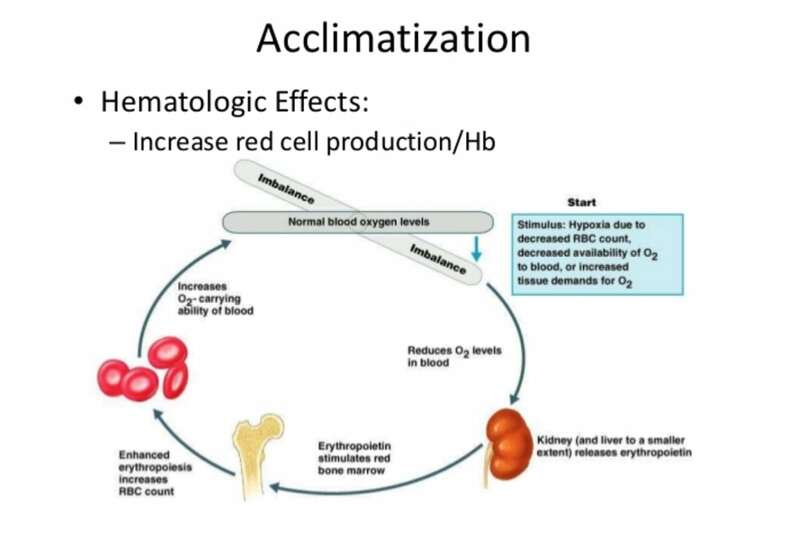 Additionally, there is a noted increase of 1.1% of hemoglobin for every 100 hours of altitude exposure, and that for every 1% increase in hemoglobin, there is a 0.6 to 0.7% increase in VO2max (20). Generally speaking, there is a maximum that your hemoglobin, and therefore hematocrit, can increase as with these increases there is also an increase in blood viscosity, or blood thickness. The body is pretty good at avoiding maladaptation, but blood viscosity that is too high involves a risk for medical complications such as blood clots, strokes, and kidney injuries. When it comes to normobaric hypoxia exposure, the length of time appears to remain fairly constant with athletes seeking ideally 21 to 28 days of exposure time. The bigger question with normobaric exposure, since the most likely modality being used is an altitude tent or room which either scrubs oxygen going into the space or increases the percent of nitrogen being inhaled (thus decreasing the oxygen being inhaled), is how long you need to spend in the room or tent every day to achieve ventilatory and hematologic changes. This is a topic that has been discussed extensively over the past decade, and the general consensus for athletes living below 5,905 feet (1,800 meters) is 12 to 16 hours a day at a simulated altitude of 8,200 to 9,842 feet (2,500 to 3,000 meters) (10,12,15). There are two major issues with this, in the feasibility of confining an athlete for that long each day and how sedentary that makes them. Although the reason many athletes do not see a hematologic response at low elevations via normobaric hypoxia has not been investigated fully, we can draw lines to research conducted by entities like NASA and some European aeronautics research groups. NASA has conducted a series of bedrest studies over the past 15 years and when evaluating blood-plasma volume, they’ve found that even a few days of bedrest can cause blood-volume loss of 15 to 20%, clearly an issue when it comes to trying to create adaptations that should ultimately increase your blood plasma volume (19). However, there have been several studies showing that the use of altitude tents for only nine to 10 hours a night at a simulated altitude of 8,200 to 9,842 feet (2,500 to 3,000 meters) for 21 days while living at 5,905 feet (1,800 meters) will create the hematological changes that occur during hypobaric hypoxia exposure (15,13). It’s important to note that these studies were conducted by the Australian Institute of Sport, the University of Tokyo, and the U.S. Army Research Institute for Environmental Medicine and do not have conflicts of interest with companies manufacturing normobaric hypoxia devices. The biggest notable difference between normobaric and hypobaric hypoxia appears to be, for not fully understood reasons, that there is a slower return to pre-altitude hematological and performance values with hypobaric hypoxia of 16 to 21 days compared to as few as seven to 12 days with normobaric hypoxia. In addition to these more traditional altitude-acclimation protocols, there has been a keen interest in the effects of short daily simulated hypoxia during exercise on either inducing altitude acclimation or helping maintain altitude acclimation once you return sea level, something like 10 minutes to three hours of day of normobaric hypoxia exposure during exercise. Unfortunately, what these studies show is no recorded change in red-blood cell mass despite increases in EPO levels after four weeks of use, although it does appear there is an effect on ventilatory conditioning to hypoxia (10, 14). There is some degree of individual variation when it comes to altitude acclimation. Over the past decade, phrases have been tossed around like ‘responders versus non-responders’ that in many scientific circles have been called ‘buzz words’ or similar. Research has, indeed, shown that certain individuals do not undergo the normal increase in EPO and hemoglobin that is expected when exposed to altitude. However, the underlying causes of why have not been fully explored despite there now being known altitude-acclimation inhibitors, which we discuss shortly. In that vein, you as an individual might have both positive and negative experiences at altitude. This does not make you a permanent non-responder, and it reinforces the importance of context and understanding what other variables might be in play. What some may not realize is that there are factors that can easily inhibit your ability to adapt to altitude. One of these factors includes injury or illness, as inflammation actually reduces hemoglobin at sea level, and this can be compounded further by elevated levels of cortisol, your body’s chief stress hormone. Many exercise physiologists suggest you do not do any high-intensity training in the days leading up to travel to altitude to avoid going into that training time with unnecessary inflammation. Another important factor is iron status, specifically iron stores that can be measured as serum ferritin. There have been several studies showing that athletes attending altitude training camps with low ferritin (less than 35 ng/mL for an athletic population) saw no change in their red-blood-cell mass or VO2max even after four weeks of altitude exposure (10). It is because of this that I suggest you monitor your iron status before traveling to altitude or investing in an altitude tent. Many physiologists suggest athletes use iron supplements while at moderate to high altitudes in order to help stimulate erythropoiesis. You can’t make adaptations if your body is already behind the eight ball. Not everyone has the luxury of either traveling to a location in advance of an event or can afford a normobaric hypoxia device like an altitude tent. If it’s your A race and you are short on time, either arriving the night before to avoid the 24-hour slump of your body starting to use energy for making adaptations or arriving at least five days in advance so that your race is after the bulk of the acute adaptations have taken place are your best two options. General recommendations, however, acknowledge the importance of chronic exposure, and include three to five days for races at 1,640 to 6,561 feet, one to two weeks for races at 6,561 to 9,842 feet, and at least three weeks for races over 9,842 feet (14). There is some research, although limited, on HSP90, and utilizing heat in what we referred to earlier as cross-acclimation to prepare for races at altitude while living at low to moderate elevations (7,8,11). Just as you would use the sauna post-exercise for 20 to 30 minutes during your heat-acclimation protocol, you can do the same thing here. However there is one key difference: dehydration is important. Why is dehydration important? Dehydration reduces blood flow because of the temporary loss in blood volume. Your kidneys register this drop in blood flow, and therefore drop in oxygen the same way it would register a drop in delivered oxygen at altitude. This triggers the cascade of stimulus from HIF-1, which due to the heat is helped along by the release of HSP90, and causes the release of EPO without ever going to altitude. The key is being safe and slowly rehydrating over the course of three to four hours once you leave the sauna. This might get you thinking that if both heat and altitude acclimation are good, then maybe doing both in combination is better! Unfortunately, that doesn’t appear to be true. Research looking at heat acclimation alone, altitude acclimation alone, and the combination of heat and altitude found that you get similar benefits of increased performance in general at sea level from all three and no added benefit from doing both. So, it’s likely best to pick your one stimulus and limit the amount of additional stress you put on your body while trying to train. Remember, for performance, what is most important is finding the smallest possible dose you need to get the desired results. Like with anything, there is a degree of individual variability when it comes to altitude acclimation. Physiology operates in shades of grey for multiple reasons, including genetics, so don’t get too hung up on a generic timeline for acclimation or the potential outcomes. There is room for experimentation. Altitude puts an increased demand on the body for a given workload, and because of this it is important to put an increased focus on your exercise-recovery ratio. This includes cutting back on both intensity and duration for the first three to four days at altitude (14). Garvican-Lewis L., Halliday I., Abbiss C., Saunders P., Gore C. (2015) Altitude exposure at 1800 m increases haemoglobin mass in distance runners. Journal of Sports Science and Medicine,14, 413-417. Carr, A.J, Saunders, P.U., Vallance, B.S., Garvican-Lewis, L.A., & Gore, C.J. (2015) Increased Hypoxic Dose After Training at Low Altitude with 9h Per Night at 3000m Normobaric Hypoxia. J Sports Sci Med. 2015 Nov 24;14(4):776-82. Weil J., Jamieson G., Brown D., Grover R., Balchum O., Murray J. 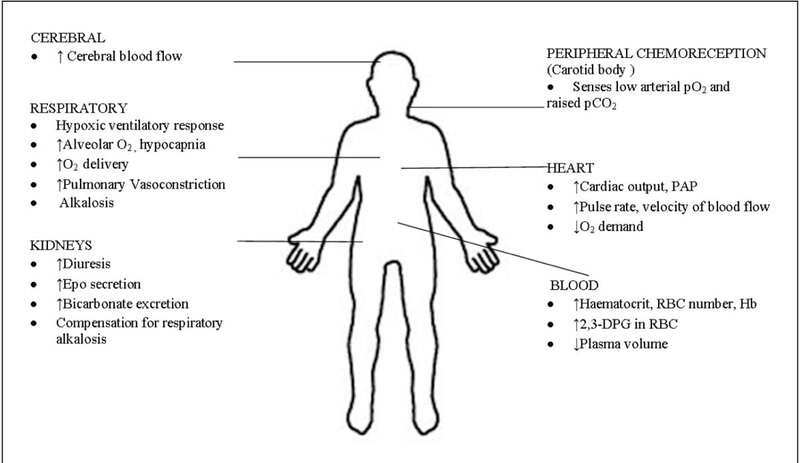 (1968) The Red Cell Mass-Arterial Oxygen Relationship in Normal Man. Journal of Clinical Investigation 47, 1627-1639. J. Mabjeesh, D. E. Post, M. T. Willard et al., “Geldanamycin induces degradation of hypoxia-inducible factor 1 protein via the proteosome pathway in prostate cancer cells,” Cancer Research, vol. 62, no. 9, pp. 2478–2482, 2002. Karam, E.H., Srinivasan, R.S., Charles, J.B., & Fortney, S.M. (1994). The effect of blood volume loss on cardiovascular response to lower body negative pressure using mathematical model. J Gravit Physiol. May; 1 (1): pp. 96-97. Saunders P.U., Garvican-Lewis L.A., Schmidt W.F., Gore C.J. (2013) Relationship between changes in haemoglobin mass and maximal oxygen uptake after hypoxic exposure. British Journal of Sports Medicine 47(Suppl 1), i26-30. Nice. A little scientific support on local folklore. . . . doing all these long dehydrating runs in the summer heat and humidity down here in flat, sea-level, East Texas actually does do some sort of “cross-acclimation” for those late summer/early fall mountain altitude races up in Colorado and Utah. Thanks!!! Any studies or thoughts on the value/risks of Diamox (acetazolamide) in speeding acclimatization? My wife and I sometimes take Diamox (coming from Kansas) when we get “high”, and I believe it’s purpose it to keep the brain from swelling at altitude, which decreases nausea, something like that. It also makes all beer taste like tin-foil. Are there any studies on how quickly adaptations to altitude degrade? For example, if I live at altitude and then vacation for two weeks at sea level, how much will my adaptations have degraded when I return to altitude? (Sea level vacation) as an opportunity to get in quality speed work which is harder to do living at altitude. Corinne, I assume the loss of benefits is gradual, so is that 16-21 days for total loss of the benefits, or to begin losing the benefits? Or does it start at 16 and you’ve lost it all at 21? Used to go to university at sea level and return to 6000ft-odd for vacations, normally took about a week to ten days to adjust to the altitude again. In the other direction, typically would be about 40-50sec faster on an 8k run timetrial at sea level, after living/training at altitude for a month. That would degrade gradually until benefits were lost after 3-4 weeks. Heat exposure has also been suggested to have positive effects during exposure to a low oxygen environment. Hiestand et al. [ 33] heat-acclimated (HA) sedentary mice to 36–37 °C for either 10 or 14 days, and those that were HA survived longer before drowning (anoxia) in water. Yikes. I’d rather just wing it and go by other folks experience than drive that kind of testing. Awesome article. Crazy enough, I was just having this conversation this past weekend with my brother. He’s a Colorado resident now, regularly gets up between 6-9,000 ft on most runs outside of Boulder. On a trail run back here in PA, only 1100 ft above sea level, the humidity and sweat loss was brutal for him. The humidity levels were between 70-80% with temps in low 90s. We agreed there has to be some relative “lack of oxygen” stimulus similar to altitude exposure when accounting for high humidity and dew point. Love the science that’s backing up different modes of training, great insight for long term development and our health. Keep it coming! The Cross-Acclimation is interesting to me as a flat lander. One thing that I am curious about is how important is the dehydration? That is something new I had not heard before. I’ve seen people suggest humidity and heat training can help, but is the mechanism actually dehydration? It makes me wonder if fueling/hydrating during a long run in high heat might counter the beneficial cross-acclimation effect? Or even if heat/humidity are necessary, would just routinely becoming dehydrated help? Cool article, thanks! I live in Wisconsin at ~ 600ft elevation. The Leadville 100 has been on my bucket list, but I have no time for elevation acclimation. 2 yrs. ago I flew out the night before the Leadville Marathon, then came back the next day after the race – seemed to ‘work’ fine. Last year I did the same for the Silver Rush 50, but stayed the night of the race due to flight schedules – seemed to work fine again. I qualified for the Leadville 100 at that race, so I hope use the same game plan in a coupla weeks for the big one. For those out there with little spare time, this may be a way to try high elevation races to see how your body reacts. Have fun out there! Timing would have been right for pre-race benefit.